Frankie Dettori celebrates aboard Queen's Trust after winning the Filly and Mare Turf. 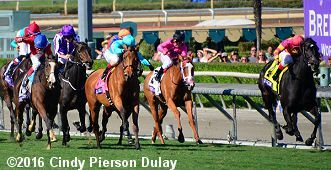 The first of four championship turf races on Saturday was the $2 million Breeders' Cup Filly and Mare Turf (G1) with 13 older fillies and mares going 1 1/4 miles over the firm Bermuda turf course at Santa Anita. 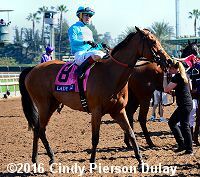 Belmont Oaks Invitational (G1) winner Lady Eli was sent off as the 8-5 favorite off her win in the Flower Bowl (G1). In to challenge her included 7-2 second choice Seventh Heaven, winner of both the Irish Oaks (G1) and Yorkshire Oaks (G1) but fifth in the QIPCO British Champions Fillies and Mares Stakes (G1) last out, and 6-1 third choice Sea Calisi, winner of the Beverly D (G1) but third in the Flower Bowl. Left: Queen's Trust heads to the winner's circle. Winning trainer Sir Michael Stoute said, "She's run a great race in the Nassau behind Minding. She had every chance that day, she just wasn't quite good enough. She hadn't had a tough season. She was unfortunate, again, in her final start in England. Came through it well, and I thought I really would like to have a crack at this Filly Mare Turf. But I needed to persuade (owners) but fortunately they came up with an affirmative, and thank God they did." 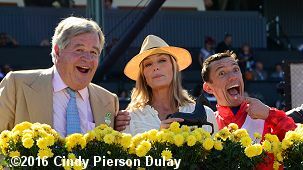 Right: The trophy presentation with Sir Michael Stoute, Bo Derek, and Frankie Dettori. Winning jockey Frankie Dettori said, "The pace was solid early. I was a little bit outpaced, but let her find her feet. When we got to the backstretch, I tried to find the spot where I could get in a challenging position, and I was very fortunate mid-turn that I got behind the favorite. And then on the straight, the first jump on me, and my first reaction, I thought, well, I'll be a good third. Then she started to motor and, it's a sure straight, but those last hundred yards make a big difference, and she got into top gear, and we flashed past the line, I was pretty much sure that we won." Left: Queen's Trust walks over to the turf course before the race. Chris Richardson, racing manager for Cheveley Park Stud, said, "The filly is hugely talented. We've seen her perform. She's had good draws and been a little unlucky in a number of the races that she's been competing in at the Group 1 level. And she's shown a terrific turn of foot, and past horses like her, a true champion in the final stages of her last three starts. That was certainly shown today." Right: Queen's Trust heads back to the barn. 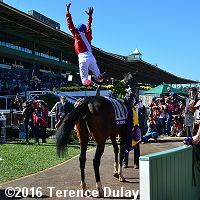 Jockey Frankie Dettori makes his signature leap off Queen's Trust in the winner's circle. Second place finisher and beaten favorite Lady Eli walks over to the turf course before the race. 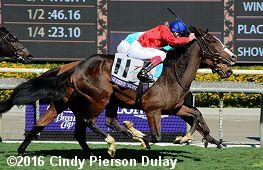 Trainer Chad Brown said, "I was thrilled the way she ran today.�I was somewhat concerned to see her so far back early, because it left her with so much to do.� Irad was hopelessly trapped early, but somehow miraculously got out in the final turn to give her a chance to win.� I wasn't sure which filly got it at the wire, but the more I saw the replays, the worse it looked for us. 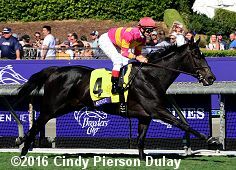 Frankie rode a fabulous race and it was just two great horses down to the finish line.�Naturally, I'm disappointed, but still very proud of her." Right: Third place finisher Avenge leads first time by. Trainer Richard Mandella said, "She ran terrific. She's come a long way since the summertime. �I just left it to Flav. He kind of likes that (front-running) stuff. I'm very happy with her." Jockey Flavien Prat added, "We had a good trip. She was comfortable on the lead. She ran a good race." 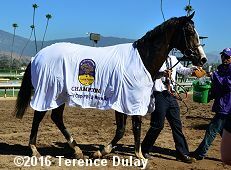 2016 Breeders' Cup Thursday Works - Photos and comments for 39 of the Breeders' Cup horses on Thursday November 3 in the morning at Santa Anita, including Found and the rest of the Aidan O'Brien horses out of quarantine. 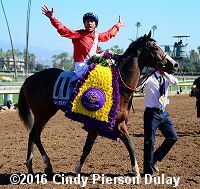 2016 Breeders' Cup Wednesday Works - Photos and comments for 33 of the Breeders' Cup horses on Wednesday November 2 in the morning at Santa Anita, including Flintshire and Beholder as well as California Chrome. 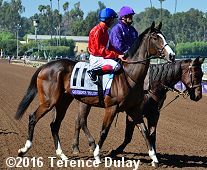 2016 Breeders' Cup Tuesday Works - Photos and comments for 66 of the Breeders' Cup horses on Tuesday November 1 in the morning at Santa Anita, including California Chrome. 2016 Breeders' Cup Monday Works - Photos and comments for 53 of the Breeders' Cup horses on Monday October 31 in the morning at Santa Anita. 2016 Breeders' Cup Entries - Final entries were taken and post positions drawn on Monday for the 13 Breeders' Cup Championship races on November 4 and 5 at Santa Anita. Check out the post positions, odds, and horses for all the races. Breeders' Cup program pages to print - these are the short version with number, odds, silks, and basic info from BreedersCup.com for Friday and Saturday. DRF Quick Sheets for the Breeders' Cup - a very short overview the last 3 Beyer figures for all the horses for Friday and Saturday. Review: Crushing the Cup 2016 - by Jim Mazur and Peter Mallett. An invaluable tool for trying to unlock the mysteries of handicapping the Breeders' Cup races at Santa Anita. Updated for 2016, this is their 25th anniversary edition. 2015 Breeders' Cup Saturday Results - The feature race was the $5 million Breeders' Cup Classic won by American Pharoah. Get the results, charts, and photos for all 9 races here. 2015 Breeders' Cup Friday Results - Friday was headlined by the $2 million Ladies Classic won by Stopchargingmaria. Get the results, charts, and photos for all 4 races here.